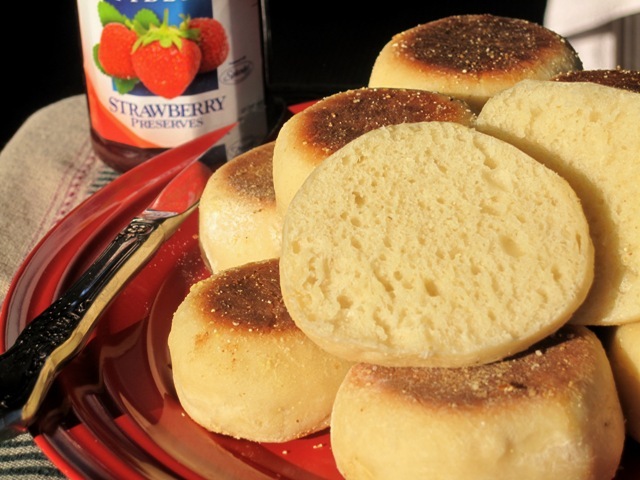 I love an English Muffin for breakfast, to make an Egg McMuffin, or an Egg Sandwich with boiled egg slices, or just have it toasted with cream cheese and fruit preserve…yummmm. My children loved a quick microwave pizza, for their after school snack, using English Muffins, Pizza Sauce, Pepperoni and Mozzarella cheese. I found this interesting recipe for English Muffins to make from scratch in my own kitchen, so of course I was very excited to try it. I did make some changes to the original recipe, so if you plan to make these my way, you will need my list of ingredients, and directions. Not only it will be cheaper for me (cost of Thomas’s English Muffins really jumped up lately), but fresher and tastier, with less preservatives. My first batch turned out great, but slightly too small (3” biscuit cutter), the size of mini bagels. Next time I will be using a much larger biscuit cutter ( 4″ – 5″), since these muffins seem to rise upward, rather than outward, so they will be closer to the traditional muffin size. This recipe yields 20 deliciously small muffins. All done rising. 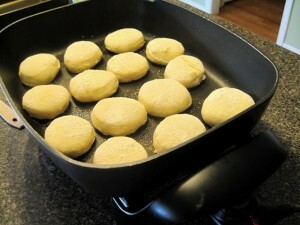 Using an electric skillet to fry them on one side, the turn over to fry on the other side. Don’t they look yummy? In a medium sauce pan add the milk, and bring it to boil. Remove from heat, stir in butter and sugar until dissolved. Set aside to cool to lukewarm. In a small bowl, add the warm water and sprinkle the dry yeast over it. In a large bowl, combine the warm milk, with the yeast. Mix in 3 cups flour, using a whisk or a fork, until smooth batter forms. Add salt and mix to incorporate. Place the remaining 2 cups of flour on a work area, scoop out the batter from the bowl, and mix into the flour to form a soft dough. Knead it few minutes to form a satiny dough ball. Place the dough in a lightly oiled bowl, turn it over couple times to lightly oil all sides,cover with a kitchen towel, and let it rise. I preheated my oven to 150 degrees, turned it off, and placed the dough in the warm oven to rise faster than at room temperature. It still takes about and hour to double in bulk. 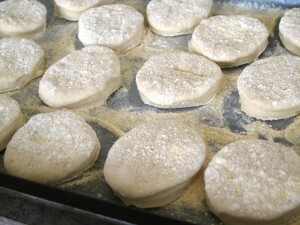 Remove the risen dough from the bowl, and place it on a work surface. Roll out gently to about 1/2 inch thickness. Line 2 cookie sheets with waxed paper, sprinkled generously with cornmeal. Cut rounds, and place them on the prepared cookie sheet. 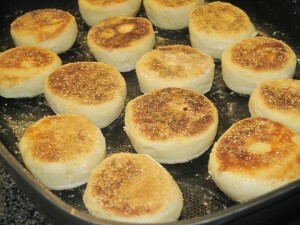 Sprinkle cornmeal over the tops of rounds, cover with kitchen towel, and let rise in a warm place for about 30-45 minutes. I used the warm oven for this, as before. Use a greased griddle, or an electric frying pan (as I did), sprayed with cooking spray, or lightly oiled with canola oil, and sprinkled with cornmeal, heated to 350 degrees...or medium heat. Place a batch of muffin rounds on the preheated frying pan (as in the picture in the post), and cook for 8-12 minutes on one side, slowly browning them lightly....or you might need to lower the heat slightly. Turn over the browned muffins, and fry on the other side for the same time period. Remove cooked muffins onto a cooling rack, to cool off, if you will not be using them right a way, and will be storing them in the fridge or freezer for a later use. Otherwise, place them on a cookie sheet, and keep them warm in the oven, until all batches are done.